In most of the samurai movies, you can see semi-transparent paper sliding doors in a Japanese house. The doors are called shouji. All the doors to traditional Japanese rooms are sliding type; there are different types of sliding doors but shouji are specially used as windows or like balcony doors to hallways that open up to outside. 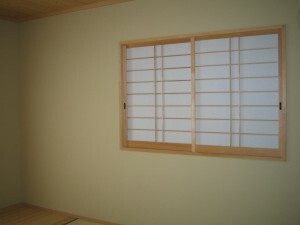 The papers on shouji serve as glass, so the room gets soft light with the shouji closed. People change the papers when they got tanned or torn. The fun part of changing the paper is to rip the old papers. Kids love to poke holes in the thin papers!